The music tents were packed and pumping the oom pah pah. And the musicians were smoking hot… You could hear some of the traces of what helped to shape the Tex Mex sound of the 1970s, a fusion of German music with Spanish instrumentation, the tuba meets the 6-string (Doug Sahm would have been right at home here). Where I grew up we called them potato latkes. Reminiscing… Tracie P and I went on a super fun double-date last night with aunt Holly and uncle Terry… Cocktails, Mexican food, and then the Little River Band at the intimate One World Theatre (Austin). Who said there’s no good sushi in Texas? It’s a tough job but someone has to do it… I’m currently developing a new blog for a new client and I have to admit, I’ve been completely floored by the food I’ve tasted with him. I can’t reveal the restaurateur or the blog but I will once it’s ready to launch. In the meantime, I just had to share the singed yellow tail with white soy sauce and battera kombu dressing. Above: Winemaker Luciano Gomiero of Vignalta (center), pioneer and unsung hero of one of my favorite appellations in the world, the Colli Euganei (Veneto). That’s my friend, the aptly named, Marco Tinello (right, the Veneto’s “best sommelier” 2008), who led our vinous journey to the Euganean Hills so beloved by Petrarch in mid-September. There is no place in Italy that I feel more at home then the Veneto, where I spent many years at university and playing music. And there is no other place where my interests converge more mellifluously than the Colli Euganei, the Euganean Hills south of Padua, where my beloved Petrarch and great wines meet. Petrarch took refuge in these hills toward the end of his life and it was here that he transcribed and edited his life’s work, including the Rerum Vulgarium Fragmenta, his fragments of vernacular things, a songbook composed of 366 poems written for Laura. Above: La Casa del Petrarca, Petrarch’s house in Arquà in the heart of the Euganean Hills, is adorned with frescoes inspired by the narrative culled from the Fragmenta. Petrarch’s favorite poet was the Latin writer Virgil and there’s no doubt that Petrarch knew and appreciated the line so often repeated from the Georgics, Bacchus amat colles, in other words, Bacchus [the divine embodiment of the vine] loves hills. To understand why Petrarch loved this immensely beautiful place and why it is ideal for raising fine wines, here are a few photos. Above: That’s a view from the hills looking eastward toward Venice and the Adriatic. The eastern plains leading to Venice are otherwise flat but south of Padua, the Eugeanean Hills rise up suddenly and violently from the flats. Above: Petrarch wrote that the Euganean Hills reminded him of the Vaucluse where he met Laura. The soil types range from volcanic to ancient seabed to calcareous clay and the different growing sites deliver rich mineral flavors in the Cabernet Sauvignon and Merlot that have traditionally been grown there. The Colli Euganei are best know for their red wines. Luciano doesn’t barrique his wines and you never find woodiness in them. His reds are defined by their rich, earthiness and minerality, tar and goudron notes. And while I’m not generally a fan of Cabernet Sauvignon and Merlot, I gladly drink his wines, which never show woodiness, and are extremely well priced (generally around $25-35 in the U.S.). I highly recommend them. Above: The 2008 Sirio (dry Moscato) was stunning, with great minerality and fruit. BrooklynGuy would have loved it. But the wines that truly fill me with emotion are his white wines, Sirio (dry moscato) and Alpianae (dried-grape Moscato Giallo) in particular. And the best news is that, like his reds, Luciano’s white wines are more than reasonably priced (the Sirio should cost about $20 retail). Above: The name Alpianae actually came from a typo, Luciano told me. It was supposed be called Apianae, a reference to a name used by the Romans for sweet wines “belonging to the bees” (in the sense that bees are drawn to sweet wines, i.e., the best wines). Luciano was the first to popularize dry Moscato in the Euganean Hills and he successfully lobbied the consortium and the Italian government to create the Colli Euganei Moscato DOC (previously you couldn’t write Moscato on the label). With the 2010 vintage, Fior d’Arancio (the local name for Moscato Giallo) will be the appellation first DOCG, also thanks to pioneer Luciano. The Vignalta whites, including the dried-grape Moscato Giallo, are some of my favorite wines in the world. And I love how they are connected to a topos so imbued with cultural riches. Indeed, Petrarch’s transcriptions and collations during the last years of his life in Arquà (a stone’s throw from Luciano’s winery) are considered to by many to be the birthing of Renaissance humanism. Like Bacchus, I love Euganean hills, too. I posted on the fantastic lunch we had that day here. Last night I was invited to participate in a food bloggers summit hosted by Caffè Bello Taverna e Pizzeria in the hipster Montrose district of Houston (the newest member of the Tony Vallone family of Italian restaurants). That’s Jedi food blogger Houston Foodie showing off his newly patented bone marrow delivery system (a straw!). That’s Food Princess (above, left, my new BFF) and Bitspitter (right). Mr. Vallone and waitstaff treated the group of 10 or so bloggers to a 4-course tasting menu. I like Tony a lot (he’s a good friend of cousin Marty) and he’s one of our country’s leading Italian restaurateurs. But the best thing about Caffè Bello (his taverna, as he likes to call it, a family-friendly unassuming Italian eatery) is that it has one our favorite wines on the list, SP68 by Occhipinti! Above: My super good friend Joe Pat Clayton (right) was as geeked as me and Tracie P to taste natural Spanish wines last night with Alice Feiring (right). Alice Feiring hit the Groover’s Paradise like a Texas tornado. The few days she spent her with us were filled with honkytonking, two-stepping, great parties and great friends and lovers of natural wine, and a superb fish dinner prepared by Chef Esteban Escobar paired with a flight of Spanish natural wines last night at Vino Vino (the best little wine bar in Texas). The two wines that impressed me the most were the Laureano Serres 2009 Abeurador Macabeo (above, 100% Macabeo grown in clay soils, vinified with 2 days of skin contact, no added sulfite [note by importer José Pastor]) and the Els Jelipins 2004 Sumoll (Sumoll with a small amount of Garnacha, grown in clay and limestone soils, whole-cluster fermentation in open-topped barrels, no added sulfite). The Macabeo was rich and unctuous, tannic and chewy in the mouth and unbelievably delicious. The Jelipins 2004 Sumoll was mind-boggling good. Impenetrably inky and viscous on the palate, a stilnovo sonnet with alternating rhymes of earth and fruit. Chef Esteban’s excellent cooking has been reaching new heights lately but last night he took it over the top (especially considering the Herculean effort necessary to create a wine dinner using only Kosher fish and vegetables). Kim and SO Alfonso also came down from Dallas expressly for the event. Above, from left: Alice, Lewis Dickson (Texas Hill Country natural winemaker), Tracie P, Jeff Courington (owner Vino Vino), and Russ Kane (author of Vintage Texas, the top Texas wine blog). And so this morning we took Alice to the airport (she stayed with us, of course). It was a great visit and we were sad to see her go. She certainly made a profound impression on the Texans she met. And I’d like to think that they also impressed her with the Texas-sized welcome they gave her. Many wonderful bottles were opened last night in the home of our good friends Patricia Winston and Bill Head to celebrate Alice Feiring’s first visit to Texas. 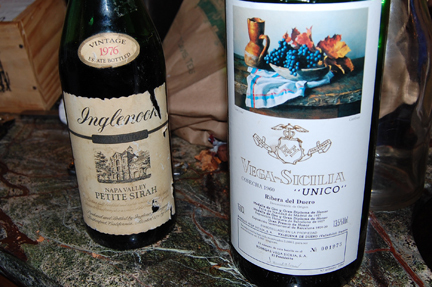 But it was Alfonso who gave her the BIGGEST Texas welcome with an unforgettable bottle of 1960 Vega-Sicilia Unico in magnum (!) and original wooden case. I was blown away by how savory and rich the wine was, vibrant and with an acidity that I frankly wouldn’t have expected in a wine this old. A truly amazing — in so many ways — bottle of wine. Patricia and Bill had assembled a who’s who of Austin-based winemakers, collectors, and wine professionals for the occasion. But it was Devon Broglie (right, with me, center, and Alfonso, left) who stepped up to the plate to extract the cork. Nice work, Devon! Even Alice looks TALLER in TEXAS! That’s our good friend, journalist, author, and radio personality Mary Gordon Spence (right). 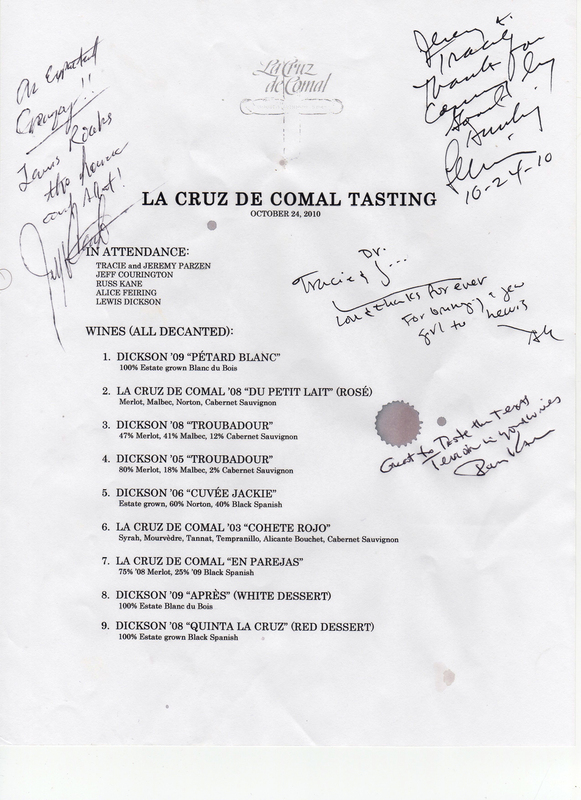 Vineyard walk and tasting with Alice Feiring, Russ Kane, Jeff Courington, and winemaker Lewis Dickson at the Cruz de Comal winery, Texas Hill Country. Click image for flight tasted. A schlub from Southern California had the very distinct pleasure and honor of escorting two very fine ladies out on the town in Austin, Texas last night. After a quick stop at Vino Vino (where Alice will be speaking tomorrow night at a dinner in her honor, featuring unsulfured Spanish wines imported by José Pastor), we just had to head over to another one of me and Tracie P’s favorite restaurants, Fonda San Miguel, for some 1998 Tondonia Rosada by López de Heredia (hell yeah!). After all, didn’t Alice write the book on this winery and the wines that have meant so much to so many of us no matter where we eat, love, and pray? Next came an intermezzo at an excellent Kentucky Bourbon and Virginia Ham party hosted by Boots in the Oven in the home of Erin and Nat (Alice didn’t eat any ham, for the record, in case you were wondering). And what first visit to the Groover’s Paradise would be complete without some two-stepping at the Broken Spoke and honkytonking at Ginny’s Little Longhorn Saloon? Didn’t I read once in the New York Times that Austin is the type of town where “everyone gets home safe”? Happily somehow, the schlub managed to ferry his precious wards back to tranquility and a roof over their heads.